Ecuadorian national legislation does not specify clearly the circumstances in which law enforcement officers may use firearms. Under the 2008 Constitution of the Republic of Ecuador, “The Armed Forces and National Police Force are institutions aimed at protecting citizen rights, liberties, and guarantees.”Art.158, 2008 Constitution of Ecuador.It is also stipulated that, “The members of the National Police Force shall receive training based on human rights, specialized research, prevention, control, and crime prevention, and the use of methods of deterrence and conciliation as alternatives to the use of force.”Art. 163, 2008 Constitution of Ecuador.With respect to police accountability, “In compliance with the principle of jurisdictional unity, the members of the Armed Forces and the National Police Force shall be charged and tried by regular justice. Misconducts of a disciplinary or administrative nature shall be subject to their own procedural standards.”Art. 188, 2008 Constitution of Ecuador. The 2009 Law on Public and State Security requires that the security forces respond in a proportionate manner to security threats.Art. 4(d), Ley Org. No 1, 2009.In the past, the Criminal Code of the National Police has given a broad exemption from responsibility to the police for the use of force, including lethal force. The Office of the Human Rights Ombudsman is given the authority by the Constitution of Ecuador to investigate alleged unlawful use of force by the Ecuadorian state, including the police. The Office is specifically called upon: "To exercise and promote surveillance of due process of law and to immediately prevent and stop all forms of cruel, inhumane and degrading treatment."Art. 215, 2008 Constitution of Ecuador. In 2017, in its Concluding Observations on Ecuador’s seventh periodic report under the UN Convention against Torture, the Committee against Torture expressed concern about allegations of torture and other inhumane treatment in prisons and recommended that Ecuador launch and provide information on full investigations into the allegations.Committee against Torture, Concluding Observations on Ecuador, UN doc. CAT/C/ECU/CO/7, 21 January 2017, §35, 36.The Committee similarly expressed concern about the allegations of excessive use of force against protesters and called on Ecuador to launch full investigations into the incidents.Committee against Torture, Concluding Observations on Ecuador, UN doc. CAT/C/ECU/CO/7, 21 January 2017, §39, 40. In a number of cases, the Inter-American Court of Human Rights has considered alleged violations of the rights to life and/or to physical integrity by the Ecuadorian police.Arts. 4 and 5, 1969 Inter-American Convention on Human Rights. In its 2007 judgment in this case, the Court held that Ecuador had violated the right to life of the applicants – suspected drug dealers – who were killed during an operation by the Ecuadorian armed forces and national police. The Court found "no evidence demonstrating that agents of the armed forces who participated in the operation attempted to use less-lethal means of intervention in the specific case of the alleged victims", and concluded that Ecuador had not proved that the action of its security forces "was necessary and proportional in relation to the exigencies of the situation".Inter-American Court of Human Rights, Zambrano Vélez and Others v. Ecuador, Judgment (Merits, Reparations and Costs), 4 July 2007, §108. 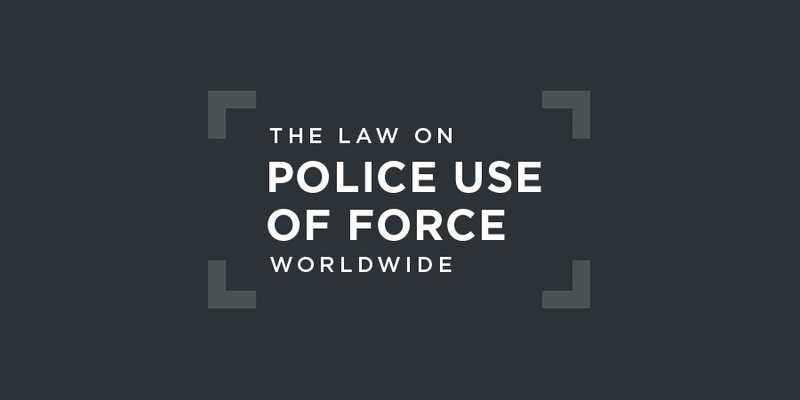 The use of lethal force and firearms against individuals by law enforcement officials – which must be forbidden as a general rule – is only justified in even more extraordinary cases. The exceptional circumstances under which firearms and lethal force may be used shall be determined by the law and restrictively construed, so that they are used to the minimum extent possible in all circumstances and never exceed the use which is "absolutely necessary" in relation to the force or threat to be repealed.... When excessive force is used, any resulting deprivation of life is arbitrary....Inter-American Court of Human Rights, Zambrano Vélez and Others v. Ecuador, Judgment (Merits, Reparations and Costs), 4 July 2007, §84. The use of force must be limited by the principles of proportionality, necessity and humanity. Excessive or disproportionate use of force by law enforcement officials that result in the loss of life may therefore amount to arbitrary deprivations of life.Inter-American Court of Human Rights, Zambrano Vélez and Others v. Ecuador, Judgment (Merits, Reparations and Costs), 4 July 2007, §85.